Daido Group maintains their main office operations in the center of Tokyo’s business district. Daido Group also has a office, distribution and packaging facility in USA. In addition to the above, Daido Group also has branch office in both Taiwan and China. With our well established network of hard-working and experienced sales staff, Daido Group can provide you with the reliable information you need to strategically position your company and products in the global market. 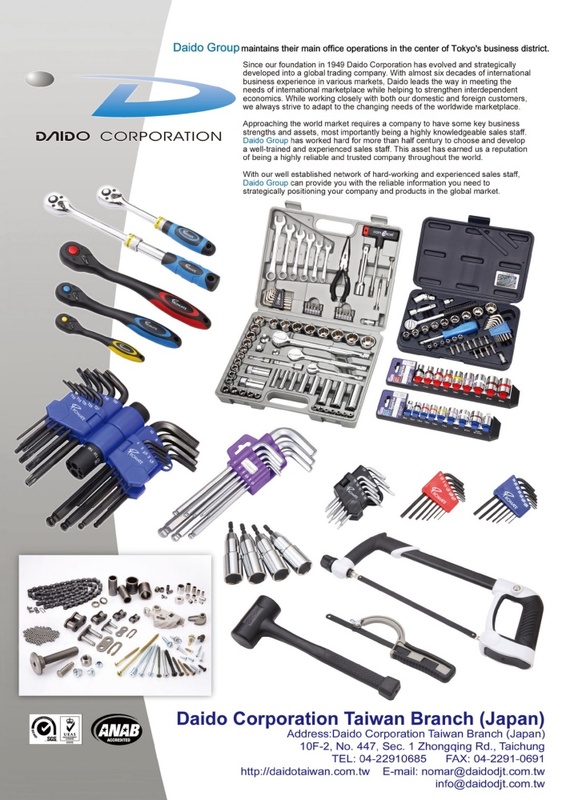 We, Daido Taiwan is branch office of Daido group who has been operating in Taiwan for over 30 years, mainly handling Tools (both powered and manual), Chain & Chain parts, machinery (both woodworking & metalworking), and industrial parts, for our customers in USA, European and Japan. To be an operating independent office in Taiwan, Daido Taiwan has to provide very competitive price, good quality product, and excellent after service to satisfy our customers worldwide to keep business running. Daido Taiwan also guaranteed to do everything we can service any new business partner without discrimination. Please don’t hesitate to contact us if you interested in any of our product.